If the Huskies are going to win their fifth straight game (Thursday night at Oregon) they’ll need another solid performance from Dickerson, who is averaging 14.5 points and 10.8 rebounds during UW’s win streak. Midway in the second half, Arizona coach Sean Miller was forced to accept what had seemed impossible before last Saturday’s game at Washington — his Wildcats had no one who could stop Noah Dickerson. Not Deandre Ayton, a freakishly gifted 7-foot-1 freshman who is projected to be taken among the first three picks in this summer’s NBA draft. And not Dusan Ristic, a rugged 7-foot, 245-pound senior who is arguably the best center in the Pac-12 behind Ayton. The Wildcats rotated both big men on Dickerson, but inexplicably Dickerson continued scoring baskets in the paint in a game that proved to be a microcosm of a breakout season for the 6-8 junior forward. After torching Arizona for 30 minutes, Miller was forced to double-team Dickerson in the post. “It’s the ultimate compliment for a big guy,” UW men’s basketball coach Mike Hopkins said. “That’s when you know you’re doing something right. The first time the Wildcats sent an extra defender at Dickerson, he squeezed between them for a short jumper. Arizona did it again on UW’s next possession and Dickerson whipped a pass to the perimeter to Matisse Thybulle who connected with Jaylen Nowell for a three-pointer. When it was over, Washington claimed a thrilling 78-75 win over Arizona while Dickerson (25 points and seven rebounds) collected a gratifying victory in his battles against Ayton (19 points, 14 rebounds) and Ristic (21 and 10). “I’m kind of challenged height-wise, I’m small,” Dickerson said afterward when asked how he found success against the Wildcats. “One of the things is my pump fakes, my footwork and putting my body into them so they can’t jump. Dickerson’s statistics are nearly identical from last season in most categories, with the exception of his shooting percentages. He ranks ninth in the Pac-12 while shooting 56.5 percent from the field, a slight increase from the 54.7 percent he shot as a sophomore. However, Dickerson has drastically improved his efficiency at the free-throw line, where he’s shooting 75.4 percent — an increase of nearly eight percentage points. “Him making free throws, that’s double trouble,” Hopkins said. “So now you can’t foul him because he’s going to the line and getting two. Dickerson flew home to Atlanta on Monday to attend funeral services for his grandfather and missed two practice days before Thursday’s game against Oregon (15-8, 5-5 Pac-12) at Matthew Knight Arena. If the Huskies (17-6, 7-3) are going to win their fifth straight game, they’ll need another solid performance from Dickerson, who is averaging 14.5 points and 10.8 rebounds during UW’s win streak. 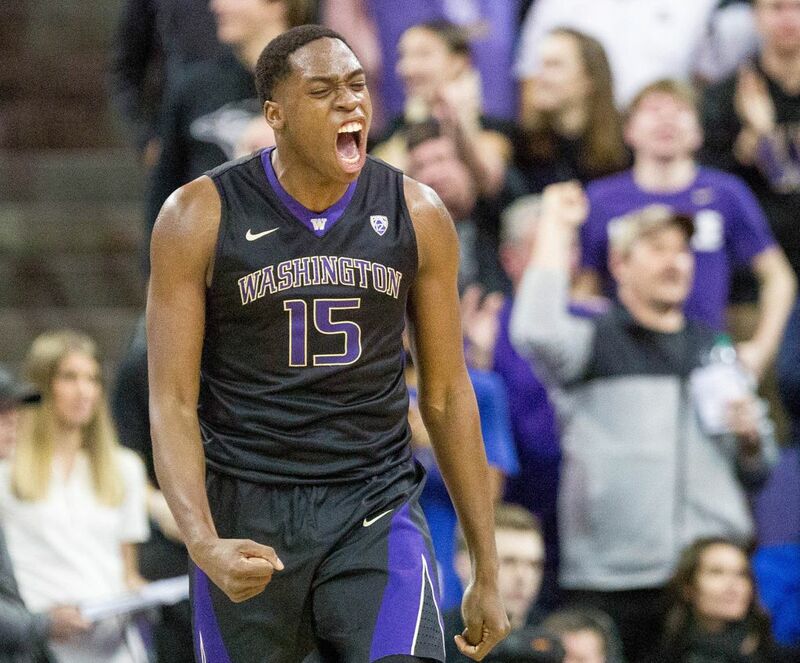 Considering the lack of depth on Washington’s front line — only three Huskies in the rotation are 6-8 or taller — it’s essential for Dickerson to stay on the court and be productive. He’s fouled out of four games this season, but has avoided foul trouble in the past seven games. Dickerson has also developed a nice rapport with junior point guard David Crisp on pick-and-roll plays, which often result in layups for the big man. “He’s just a phenomenal player,” Crisp said. “I tell him, ‘I still haven’t found anybody that can mess with you.’ … I tell him I’m going to keep looking, but I can’t find him.